There is plenty to report, but no time, so here is my pinboard of home cooking. There are just a few photos up now, but I hope the collection will grow as we continue to explore our new culinary horizons. Dinner tonight involved an old standby, this excellent recipe for tomato sauce with butter and onions. It is not only tasty but very easy and inexpensive to make. 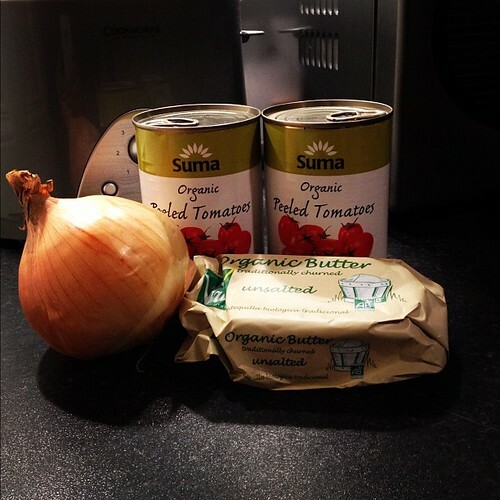 Two 400g tins of organic peeled tomatoes: £1.50. One organically-grown yellow onion: £0.25. One 240g packet of organic unsalted butter (only used 70g): £1.50. 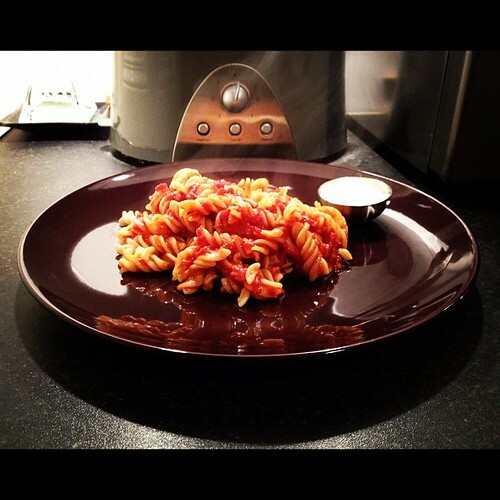 One 500g packet of Doves Farm organic brown rice fusilli (only used 200g): £2.50. Approximate total cost of two servings: £3.50. Share a simple yet tasty recipe in the comments, won’t you? wow that sound really good and easy to make. I’ll have to try that sometime. I will. it has a distinct advantage over my traditional, “take an entire weekend to make it from scratch” recipe in that it doesn’t take so long! While–don’t get me wrong–this does look exquisite I find myself stuck at the distinct lack of garlic. Take a chicken breast and put it in a saucepan. Add a bottle of beer of your choice, then if needed use water (or more beer) to cover, and boil it until done. Take the breast and dice it into bite-size chunks, and add some salt and cumin to it. Prepare either a package of frozen chopped spinach, or the equivalent of chopped fresh spinach and drain. Toss both chicken and spinach into enough egg noodles to serve two or three people, and top with oil and vinegar. Eat. This sounds delicious. I think I will try this with some gluten-free beer! Ok, I have one. I hesitate to post it anywhere, because this is mine-all-mine and it is so terrific, but I need to learn to share the love. Here ya go! This is a very not-precise recipe. 3. Cook in oven at 400 or thereabouts until it is just about done, then let it sit out for 5 min to finish cooking. Warning: this might ruin you for salmon prepared in other ways. I have been working on this for years, adapted originally from Dr. Weil’s Salmon in Parchment. The salmon is terrific here, so I look forward to trying this.